Thanks to Dr. Eman Ali Aljufairi, MD, FRCPA, Salmaniya Medical Complex (Bahrain), for contributing this case and the discussion. To contribute a Case of the Week, follow the guidelines on our Case of the Week page. (1) Thanks to Mark W Rodacker, MD, PhD, Sanford Health Bismarck, for his image contribution to Kidney tumor - myelolipoma. 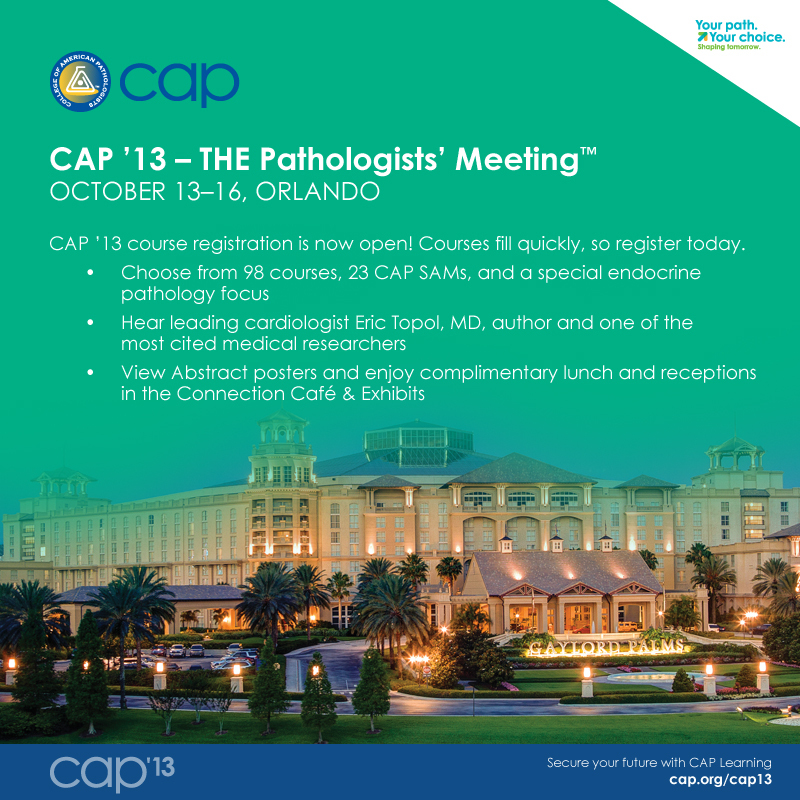 (2) Dr. Michael Masialek, Newton-Wellesley Hospital (Massachusetts), wrote an article about the role of pathologists to educate the public, that you may find useful. View the article here. (3) We have recently updated these topics in our Stains and CD Markers chapters based on the reviews by Nat Pernick, M.D. 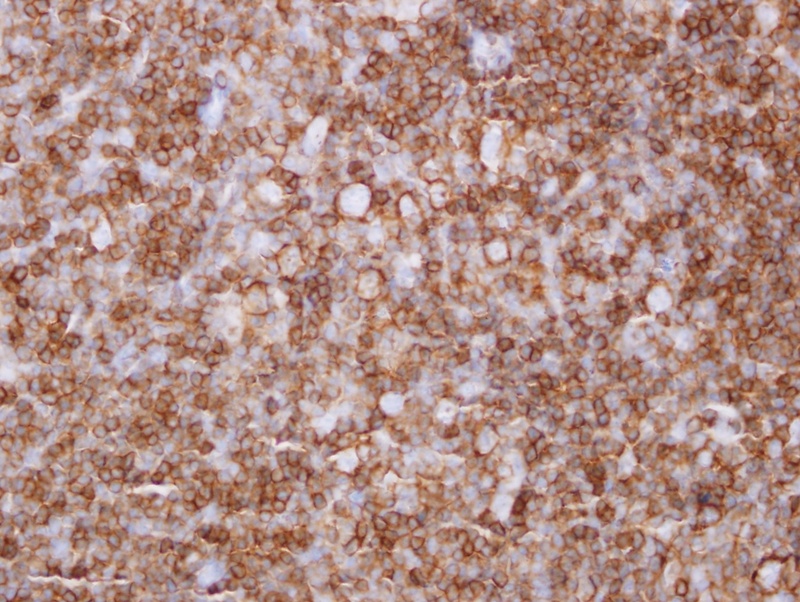 : CD2, CD2R, CD3, CD4, CD7, IHC basics, IHC procedure, A beta 42, abl, acid phosphatase, AGR2. (4) In our new Cytopathology chapter, we now have a Palpation Guided Fine Needle Aspiration (PGFNA) section written by Joe D. Jakowski, M.D. It is a comprehensive/technical FNA resource full of original material. Be sure to take a look! A 21 year old man presented with a 5 month history of a left submandibular mass. FNA was reported as reactive lymphadenitis, and his blood count was unremarkable. The mass didn't resolve and was excised. Gross: One lymph node measuring 5 x 2 x 2 cm was received. Cut surface showed multiple nodules measuring 0.5-0.7 cm in diameter. 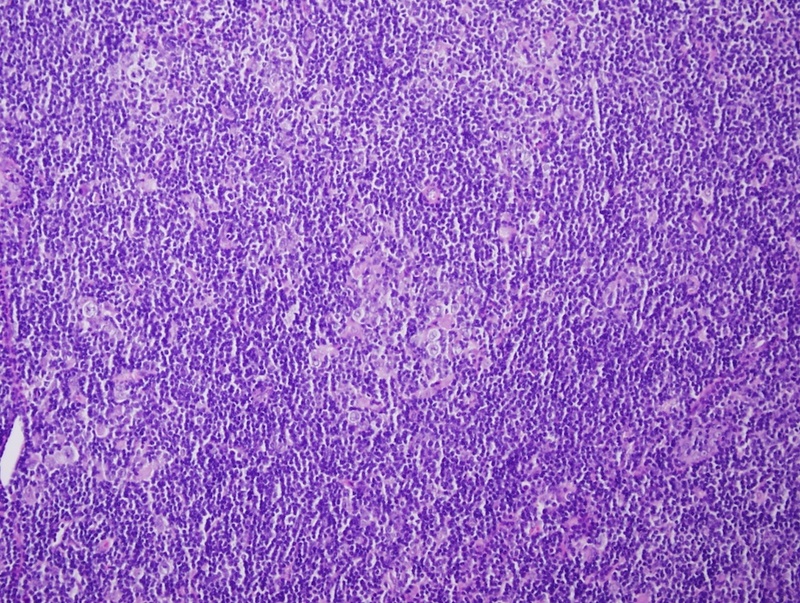 Histologically, the lymph node showed effaced architecture by a nodular lymphoid proliferation. 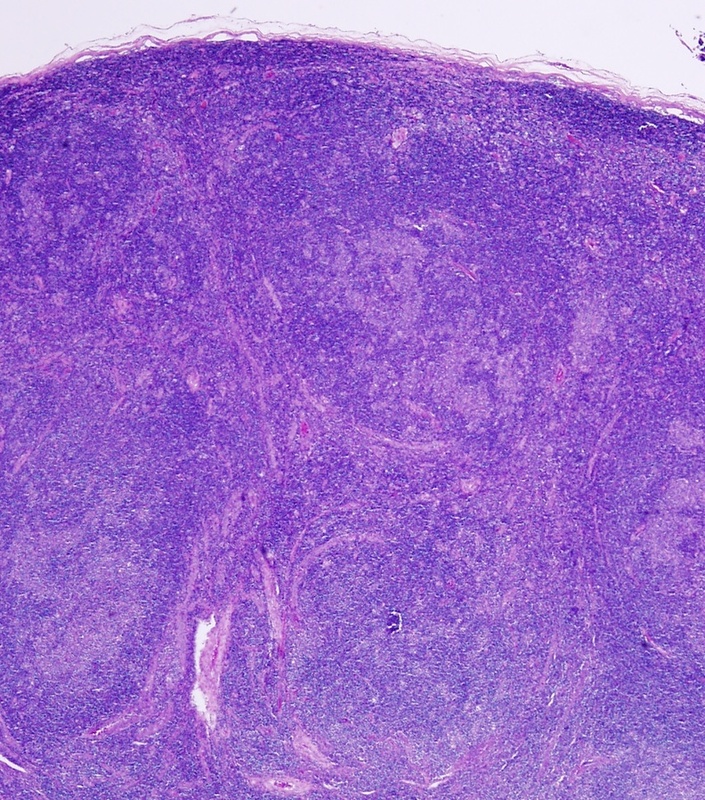 The nodules consisted predominantly of small lymphocytes with scattered large atypical cells containing moderate cytoplasm, multilobated nuclei and distinct nucleoli. 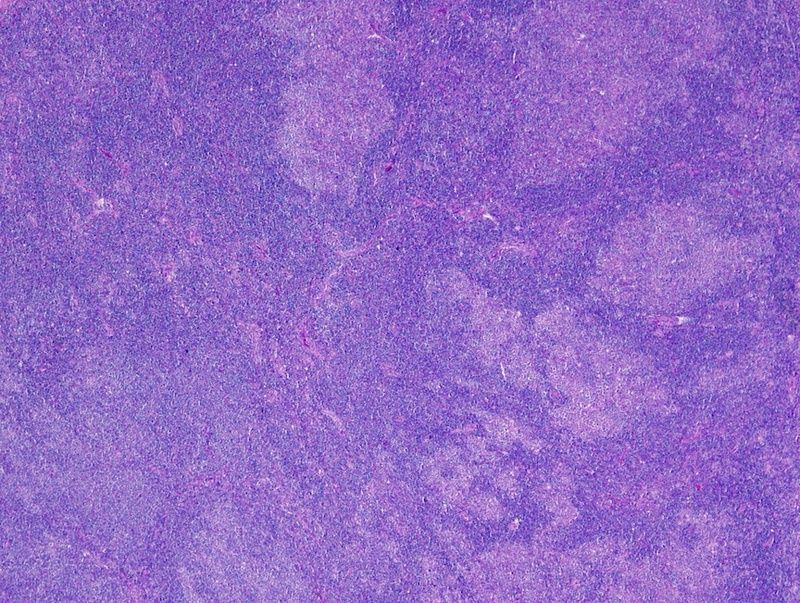 No typical Hodgkin Reed-Sternberg cells were seen. No eosinophils, neutrophils, granulomas or necrosis were noted. 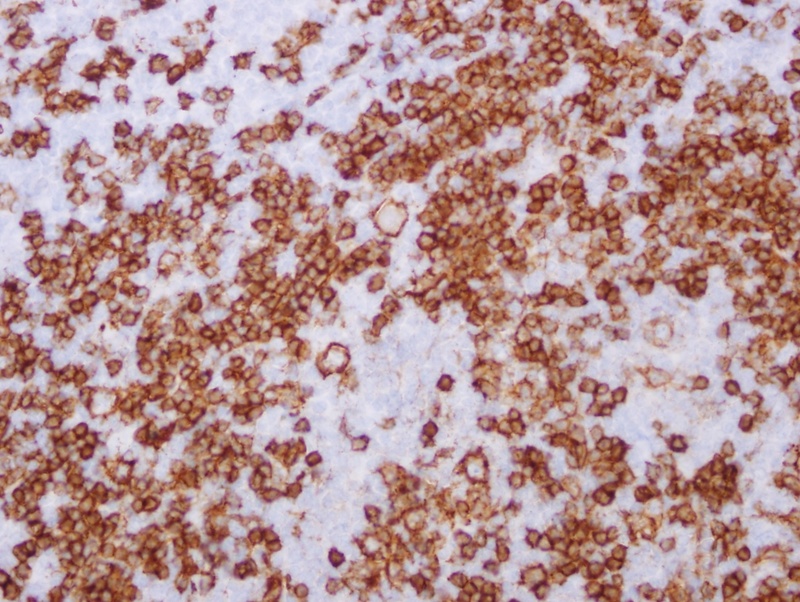 The large atypical cells were CD45/LCA+, CD20+, CD3-, CD15- (not shown) and CD30-. 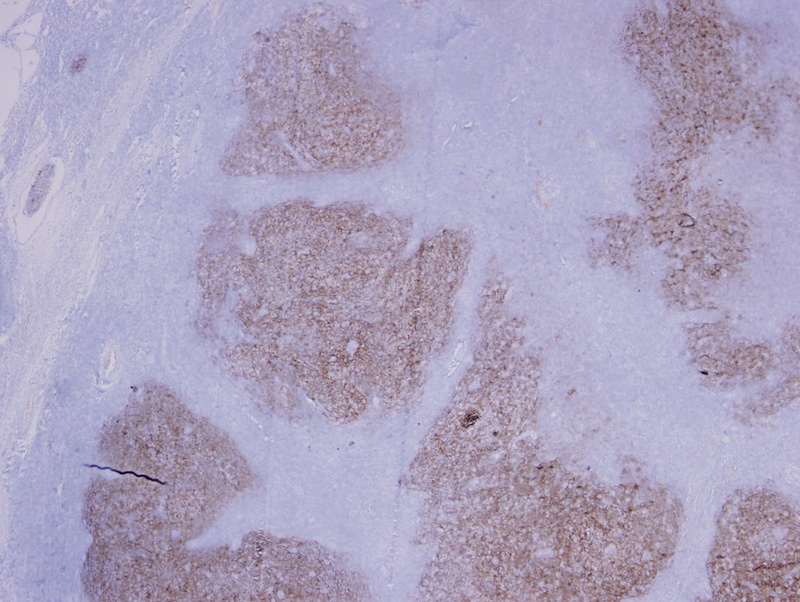 The small lymphocytes in the nodules consisted of a mixture of T and B cells. CD21 highlighted follicular dendritic cell (FDC) networks within the nodules. 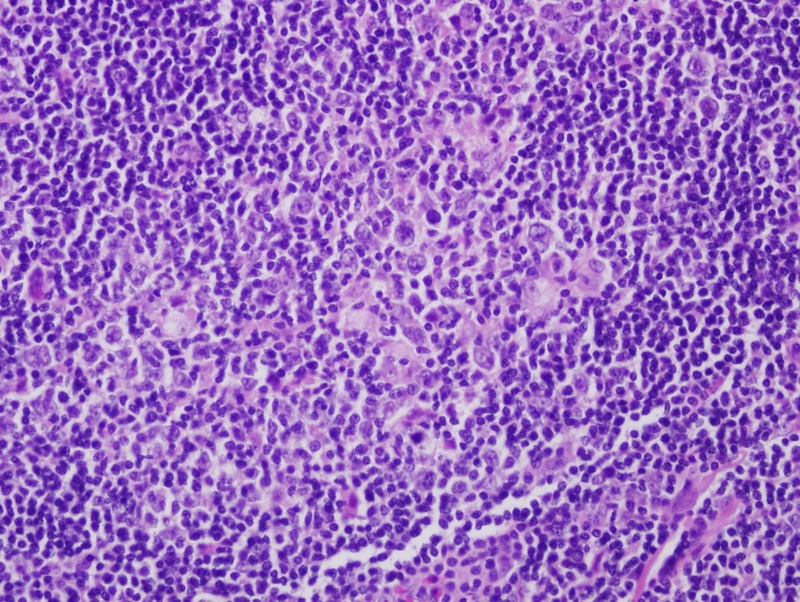 Hodgkin lymphoma is now divided by WHO into classical Hodgkin lymphoma (CHL) and NLPHL. NLPHL is defined by WHO as a "monoclonal B cell neoplasm characterized by nodular or nodular and diffuse proliferation of scattered large neoplastic cells known as lymphocyte predominant (LP) cells (L&H cells previously). These cells reside in large meshworks of follicular dendritic cells (FDC) processes filled with non-neoplastic lymphocytes and histiocytes" (Swerdlow: WHO Classification of Tumours of Haematopoietic and Lymphoid Tissues (4th Ed, Vol 2, 2008)). NLPHL comprises ~5% of Hodgkin lymphomas. It typically affects males (75%), ages 30-50 years. It primarily involves peripheral lymph nodes (i.e. axillary, cervical and inguinal lymph nodes) and 70-80% of patients present with stage I or II disease (Leuk Lymphoma 2012;53:354). B symptoms are uncommon. 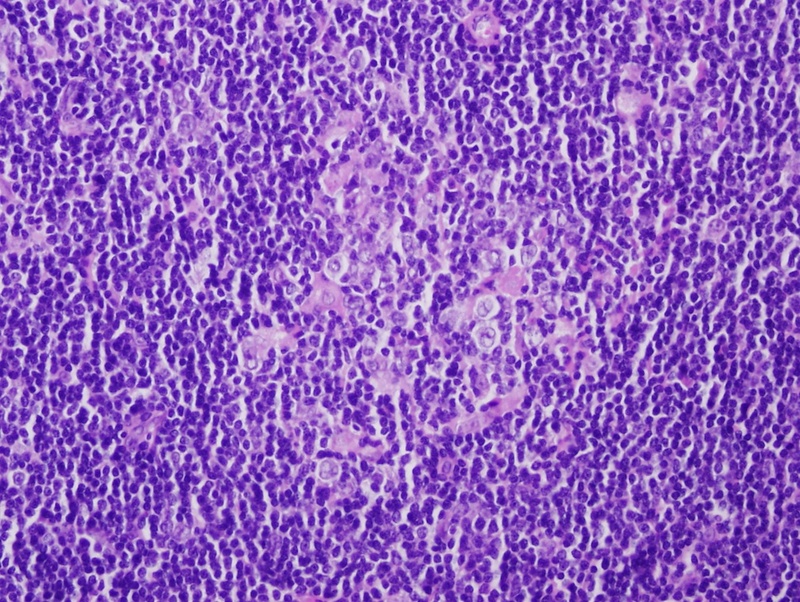 Lymph node involvement is characterized by a nodular architecture with variable diffuse areas composed mostly of small reactive lymphocytes and histiocytes. Scattered LP cells are noted. 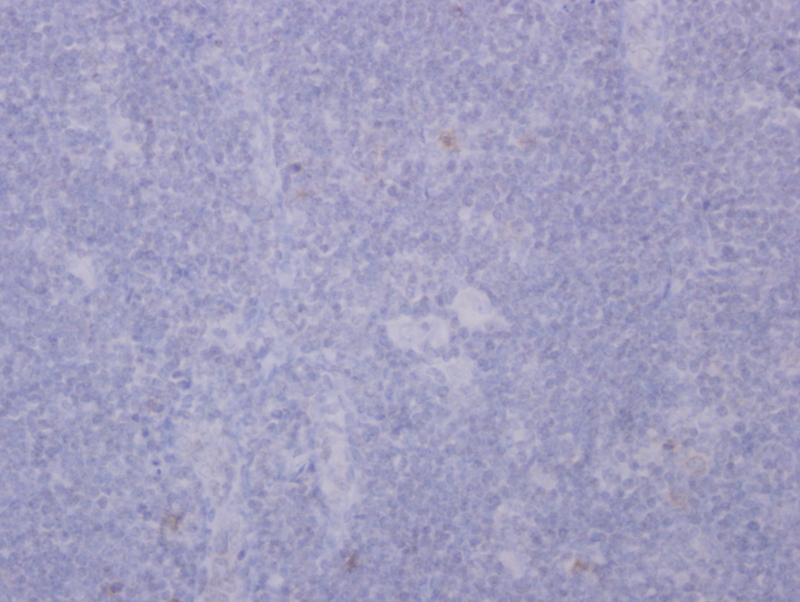 LP cells have pale cytoplasm, folded or multilobated nuclei and distinct nucleoli. They are CD45/LCA+, CD20+, CD79a+, OCT2+, BOB1+, PAX5+, BCL6+, EMA+ (50%), CD15- and CD30-. The background is rich in CD4+ CD57+ PD1+ T cells with nodules of CD20+ B cells. Latent EBV infection is absent. (1) Progressive transformation of germinal centers: usually reactive process with only focal nodal involvement and associated with hyperplastic lymphoid follicles. There are no LP cells. A small proportion of these cases precede or follow a diagnosis of NLPHL. 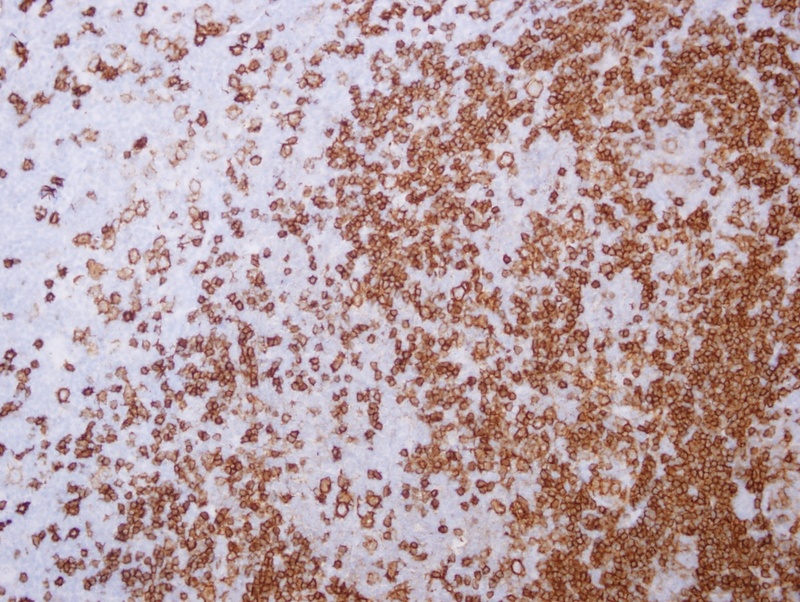 (2) Lymphocyte rich CHL: Has nodular or diffuse architecture similar to NLPHL, but has classical Hodgkin Reed-Sternberg (HRS) cells and no LP cells. The HRS cells are LCA-, CD20-/+, CD15+, CD30+, and Oct2-. PAX5 is usually positive with variable weak to moderate intensity. 40% of the cases are EBER+. 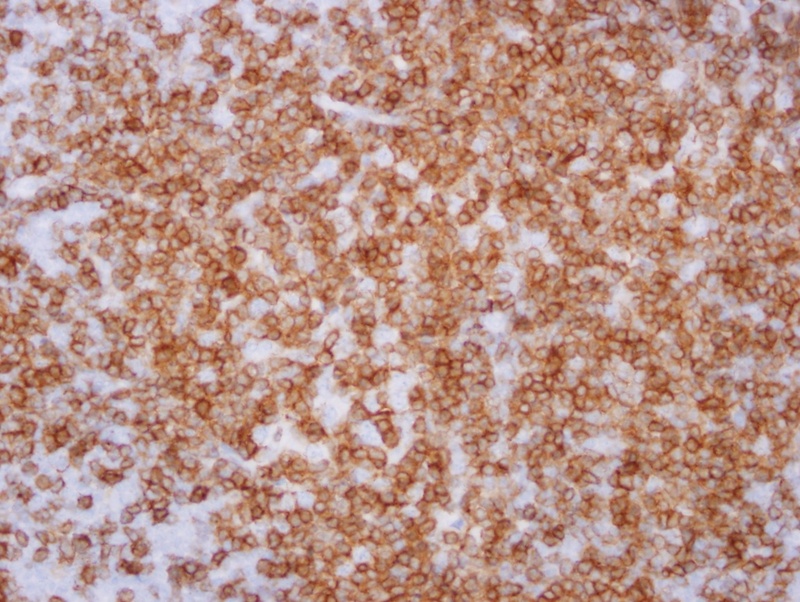 (3) T cell / histiocyte rich large B cell lymphoma: This rare (<5%) large B cell lymphoma has large atypical B cells that resemble LP cells morphologically and immunophenotypically. However, it shows diffuse architecture and lack nodules by CD21 immunostaining. The T cells in the background are mostly CD8+, compared to CD4+ T cells in NLPHL. NLPHL develops slowly but relapses frequently. Its 10 year overall survival is >80% in stage I/II. 3-5% of the cases progress to large B cell lymphoma. 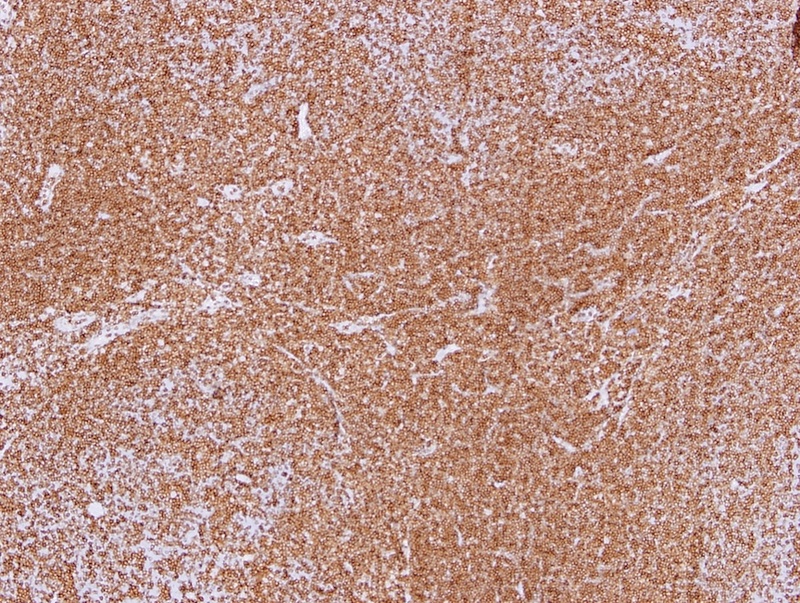 Bone marrow involvement is rare but occurs in aggressive cases.